Guardian Documentaries, the publisher's strand for short-form documentary, relaunched two years ago after learning more about its audience's preferences. The small team receives more than 1,500 pitches a year, but with only space for 20, they look for the most original, creative stories available. "We get amazing ideas from all four corners of the world, covering all subjects and territories – we have a very open mind on what we end up doing," said Charlie Phillips, head of documentaries at the Guardian. "Ideally, we are looking for people with access-driven stories, access to communities, people and situations that we may not have imagined existed. "When people email us their ideas, I'm looking for a clear idea of how the filmmaker is going to tell the story with ambition and visual flair." The publisher works with filmmakers from the beginning of a project to ensure the treatment is right for its audience. It is not looking for beautifully-written, detailed pitches, just enough to prove that the story should be told in documentary format, with a clear vision in mind. "We want a range of treatments. Our strand is defined by being varied, which I think people appreciate because there's not just one way of doing a documentary," he said, noting Black Sheep used drama to tell the story of a teenager whose life was turned upside down by racism, whereas Skip Day takes more of an observational, fly-on-the-wall approach. "All the documentary offering we do is based on the idea that our audience is adventurous, curious and interested in learning new things." Although topical, the documentaries do not follow the news cycle – they are evergreen. "We want to be able to embed the documentaries in stories that are going out on the website, and show them to people at future festivals," he said. "They are only about things happening right now – we don't do historical stories, which means they feel relevant to what's going on. "It's got to pass the test of originality and surprise – is this story telling me something I didn't already know, and do I just want to watch until the end of the film." Phillips said that the scale and ambition of the Guardian's documentaries is getting bigger all the time. "It's not true that everyone has short attention spans when they watch online video," he said. "You think about Twitter but people still sit and watch TV and go to the cinema. There is an appetite for films of all lengths, you just have to communicate to people. We encourage lean-back viewing. "Online video is so young and ever-developing – if it is a good film, people will watch it." 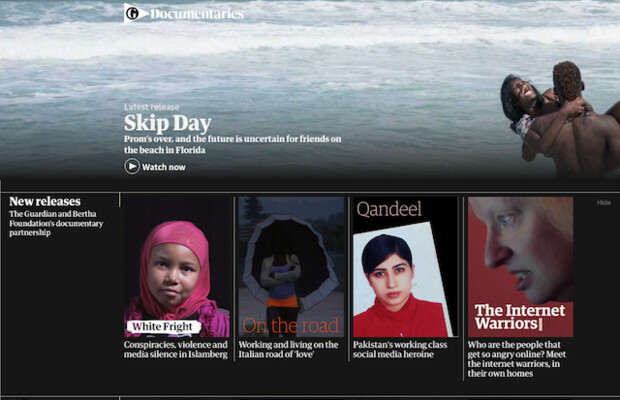 The documentaries are often re-purposed for use elsewhere on the Guardian, within podcasts, as online articles and within the Guardian magazine. "We try to offer different angles on the same story, often as a 'follow-up' piece for those audiences wanting to know what happens after," he said. Phillips noted that it is important for news organisations looking to venture into the documentary scene to find a niche that defines their strand. "Don't look at what other people are doing and feel you need to copy that. Try something different and find your individual voice."